India registered a hard fought victory over Myanmar to break their jinx of defeating Myanmar in Myanmar after 64 year long wait. It took a very late strike from hitman Sunil Chhetri to give India the much needed victory in their AFC Asian Cup Qualifiers opener. 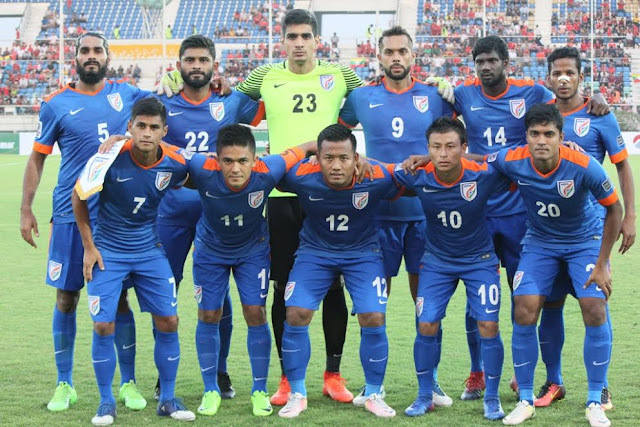 172nd ranked Myanmar played the game at a very high tempo at their home turf while Stephen Constantine's team India opted for a more cautious counter attacking approach. Centre back Anas Edathodika was handed debut by Constantine and he marshalled the defense well. Jackichand Singh should have given India the lead in the first half. Robin Singh's delivery from the left beat the Myanmar custodian all ends up and a simple tap-in opportunity was somehow skied by Jackie from handshaking distance. Sunil Chhetri's silky skills kept the Myanmar defense at their toes whenever India earned possession. India's defense stood strong against the more attack minded Myanmar side and the Blue Tigers had the last laugh. In the penultimate minute of regulation time Jeje's well timed pass was equally matched by Udanta Singh's blistering run who squared the ball to Sunil Chhetri and the fate of the match was sealed right there.